Spillway Kits Build a simple, yet beautiful waterfall using a block or stone wall with a complete kit. Atlantic Basin Kits are designed to fit perfectly with all of our formal spillways - the Color Changing Colorfalls, the Classic Colorfalls and our new Stainless Steel Scuppers. Whether you're adding the shimmering nighttime enchantment of a Colorfalls or an elegant touch of class with a Stainless Steel Scupper, our Basin Kits provide everything you need to complete the installation, from the reservoir to the plumbing to the pump, with all the fittings, double filtration, splash mat, even an Automatic Fill Valve! 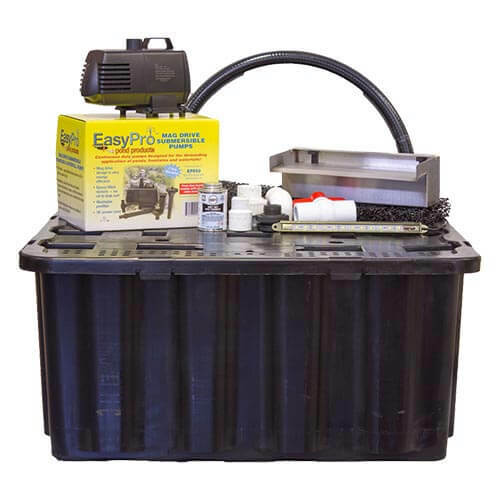 Includes: Basin, Splash Mat, pump, plumbing, PVC spray glue, adjustment valve and Auto Fill, all in one box.